Success in any sport starts with the fundamentals. That’s where we excel. We offer training for beginners all the way up to the elite Division I athlete. With 7 basketball courts and 12 volleyball courts under one roof, Suwanee Sports Academy is a national destination for travel team tournaments. It’s also the place where the better local athletes compete in leagues and tournaments throughout the year. Everything a volleyball or basketball athlete could need is all here. We train and compete year round, we offer Speed & Agility programs as well as Strength and Conditioning. We even have onsite Physical Therapy offered through Children’s Healthcare. Our My Sport after school programs offer incredible enrichment and fun for kids every week of the school year. Summer breaks and holidays are filled with multi-sport, basketball and volleyball camps throughout the year. Would you like a club volleyball team experience without the same level of time and financial commitment? VolleyAcademy might be the program for you. Suwanee Sports Academy was one of the first privately operated multi-court facilities in the nation. 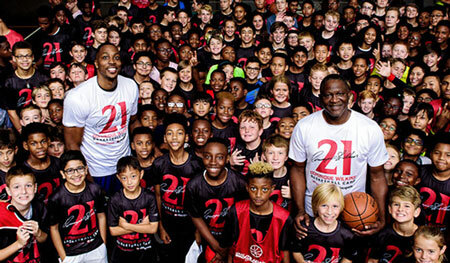 Thousands of kids have grown up in our programs over the years, and if you are a basketball or volleyball player in metro-Atlanta our 100,000 square foot facility is your home. Innovative training and high level competition are offered year round. We are also home to My Sport After School and Summer Camps, a multi-sport program for active kids who love sports. Stay connected about upcoming basketball and volleyball training, leagues and tournaments as well as special offers.